Easy Instant Pot Chicken – this chicken dinner recipe is done in under 30 minutes and is perfect every time. 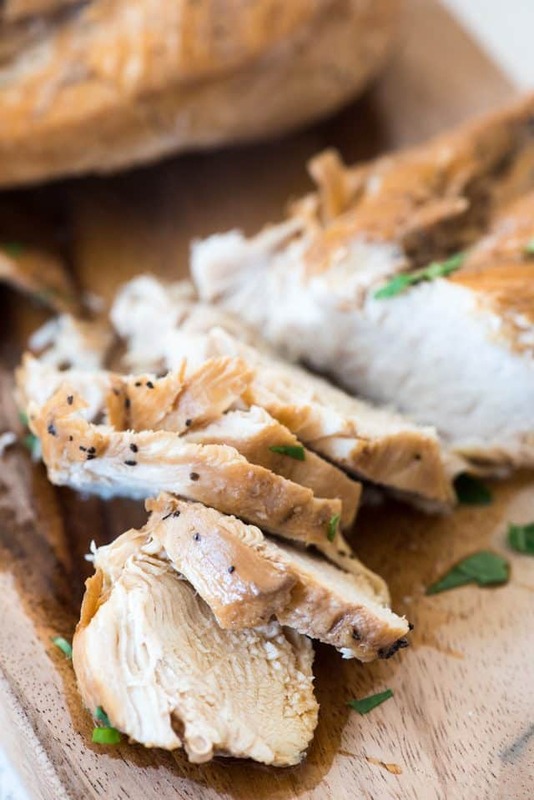 We love using our instant pot for chicken! Do you guys have an Instant Pot or other pressure cooker yet? I have the Crock-Pot version and I love using it to make fast and easy dinners. I find that I love the flavor of chicken breasts and pot roast better when it’s made in an Instant Pot. Something about the way it cooks ensures perfection every time. 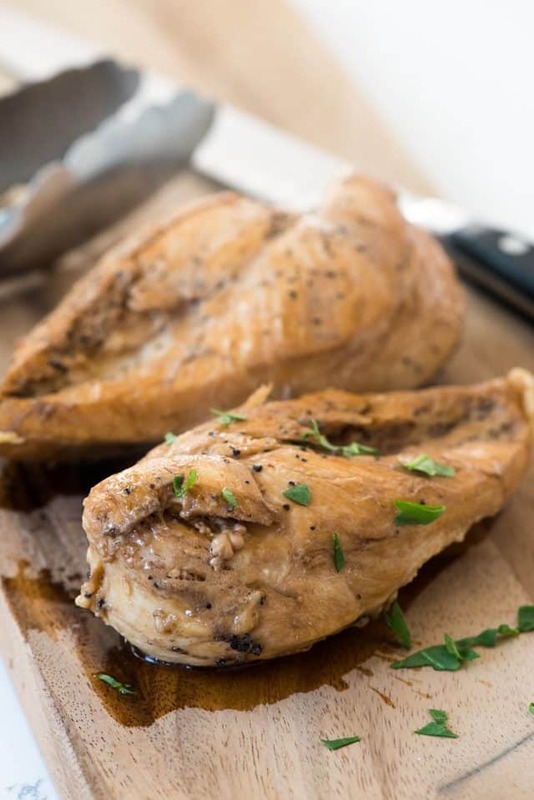 This simple instant pot chicken recipe is a versatile chicken recipe good for any busy weeknight. It’s flavorful and goes great with so many side dishes! Each pressure cooker works a bit differently, but the basics are the same. You have to have at least one cup of liquid in the pot for it to come to pressure. You have to lock the lid and make sure the toggle is in the position to hold the steam in. It takes about 10 minutes or so (depending on the recipe) for the pot to come up to pressure. Once it does, the timer counts down. After cooking, some recipes require quick release and some require slow/natural release. Quick Release is when you flip the toggle open and the steam releases immediately. Quick release can be used for vegetables or chicken breasts or other items you don’t want to overcook. Always be careful when releasing pressure: use a utensil to flip the switch and stand back. Natural Release (or slow release) is when you leave the toggle alone after cooking. The steam naturally releases from the cooker over time, which takes several minutes (at least 20-30). Natural release is best for things that will foam or bubble over, like soup, or for meat that should rest (like a roast). Intermittent Release is a mix between the two. In an intermittent release you allow the pressure cooker to naturally release for about 10 minutes, then do a quick release. I often do this with roasts or other things I’m too impatient to wait for. No matter what, follow the directions in your recipe. Be sure to read the recipe all the way through: a natural release on something that fills up an Instant Pot will take a long time to cook. 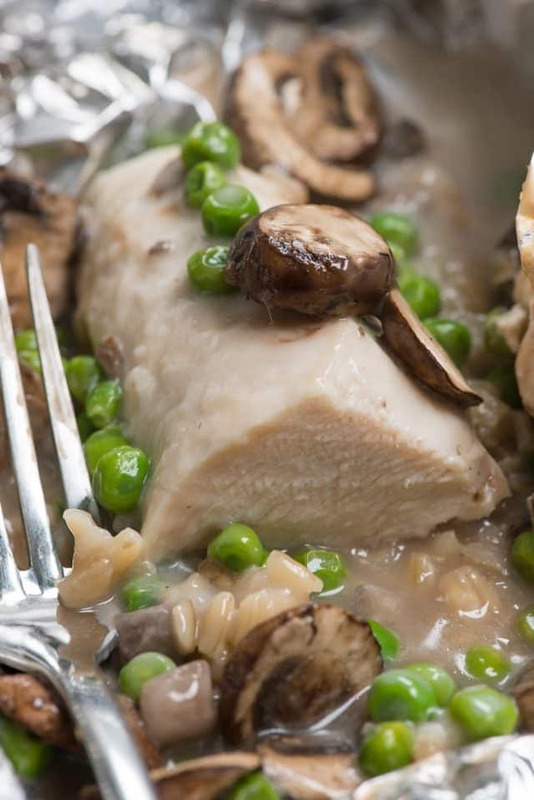 Now that we know how an Instant Pot works, let’s talk about how to make the best easy pressure cooker chicken recipe. This cooking liquid for this chicken is based off of my mom’s turkey baste. I absolutely love the flavors of soy and brown sugar that the sauce provides. Just smelling it reminds me of home. Mix together the sauce ingredients and add it and the chicken breasts to the pot. Place the lid on the pot, make sure the toggle is in the correct position, and lock the lid. Turn the pressure to high for the desired amount of time, then do a quick release when it’s done. How long do you cook chicken in the instant pot? It really depends on the size of the chicken and if it’s fresh or frozen. Fresh chicken breasts: set the pressure cooker for 10 minutes and do a quick release. 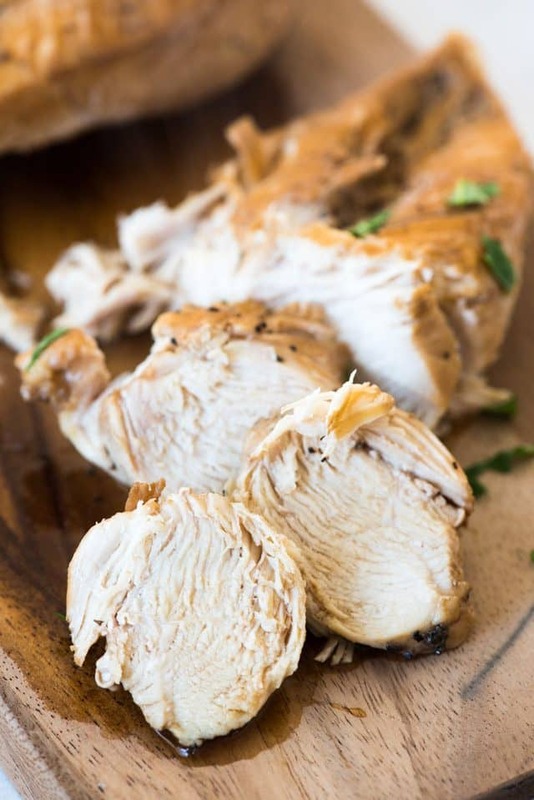 If you’re using organic (smaller) or thin sliced breasts, 8 minutes is a better option. Frozen chicken breasts: first, make sure they are not frozen together. I like using flash frozen breasts because they are frozen separately. If you have a big hunk of frozen chicken it’s not going to cook correctly. Frozen breasts take about 15 minutes on high and do a quick release. This chicken recipe is perfect served as a salad or in a pasta salad.If you want to serve it alongside mashed potatoes, you can make a slurry with cornstarch and thicken the sauce to make gravy. You can also shred the chicken for salads or sandwiches. I like to make a big instant pot of chicken on Mondays and eat off it all week long. This is the perfect and flavorful recipe for chicken! 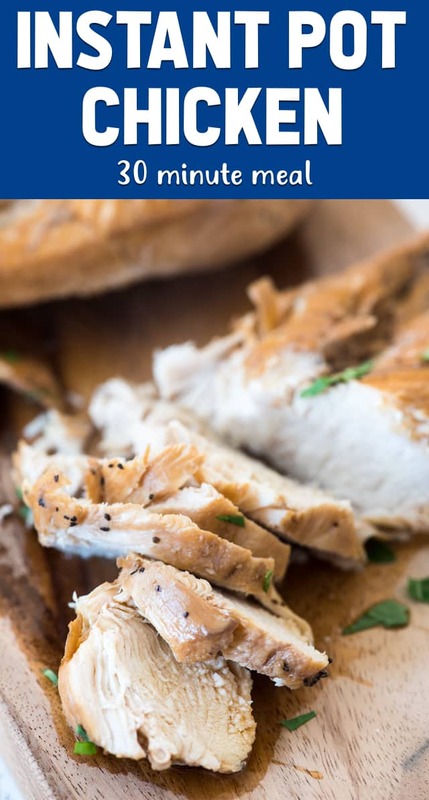 I also love making my Instant Pot Shredded Chicken for easy meal prep and my oven baked chicken breasts too! Get your own instant pot on amazon! Easy Instant Pot Chicken - this chicken dinner recipe is done in under 30 minutes and is perfect every time. Add soy sauce, brown sugar, chicken stock, and pepper to the insert of an instant pot or electric pressure cooker. Stir. Add the chicken breasts into the liquid. Place lid on the pressure cooker and lock. Make sure the pressure valve is set to keep steam inside. For fresh chicken breasts: Use poultry setting and cook on high pressure for about 10 minutes. When instant pot has finished, use a fork or utensil to do a quick release. For frozen chicken breasts: Use poultry setting and cook on high pressure for about 15 minutes. When instant pot has finished, use a fork or utensil to do a quick release. Make sure your frozen breasts are separated, not in one big ball of ice or it will take longer to come to pressure and longer to cook. Remove chicken from pot and slice. Drizzle with sauce and serve as desired. Make sauce for the chicken: remove the chicken from the sauce. Mix 1 tablespoon cornstarch with 1 teaspoon water. Turn the instant pot to sauté and add the cornstarch mixture. Cook, stirring, until it boils and thickens. Mushroom chicken foil packets are easy to make! 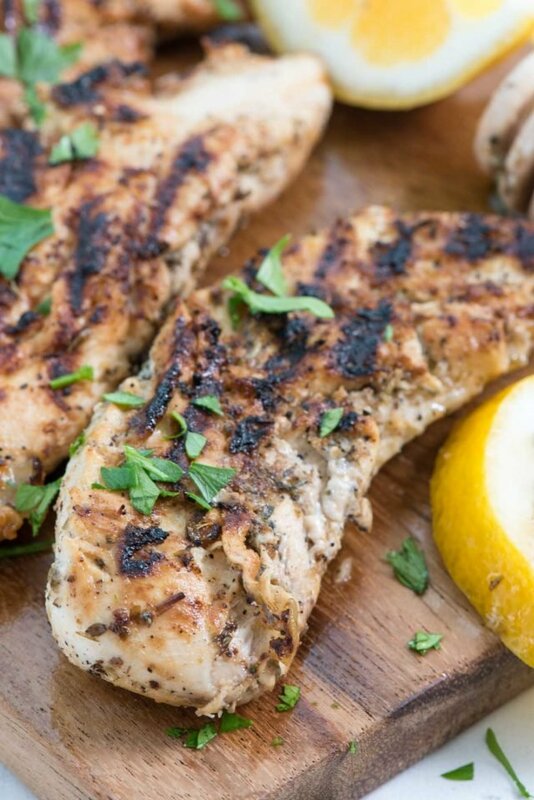 Lemon Herb Chicken is an easy grilled recipe. 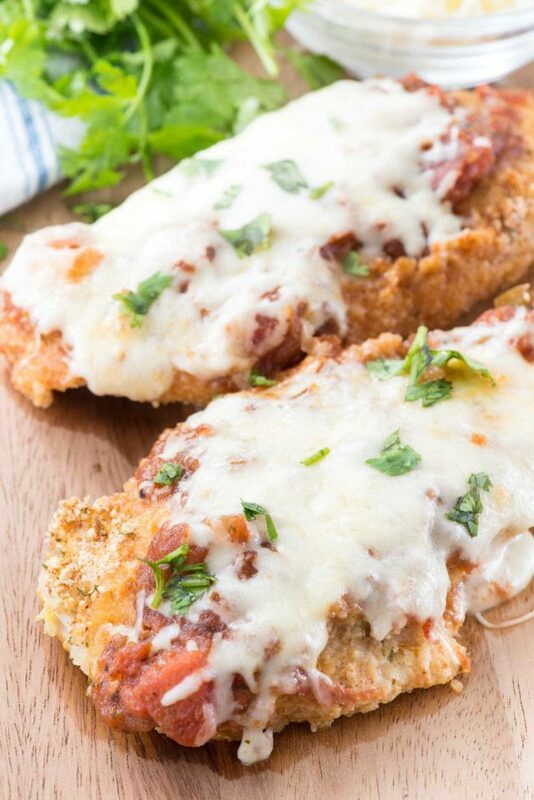 Baked Taco Chicken is my favorite! Wow, great idea. I never thought of using that baste in the pressure cooker on chicken. I think I’m going to try it with a whole chicken. YUM! Oh gosh, this look so yummy! I have a 13 at insta-pot, how long would I cook a whole chicken to use for chicken soup? The chicken ended up a little chewy. What did I do wrong? Thanks! The print option in your Chicken Breast is not working. I made the Instant Pot Chicken according to the directions along with a few tweaks and it came out very good. We like our food with a lot of spice and flavor so I added garlic powder and onion powder to the broth along with the pepper and Italian seasoning. I will add some bouillon next time for a deeper flavor. My chicken was partially frozen and it cooked beautifully in the 9 min time frame. I didn’t have enough carrots so I added onion, mushrooms and zucchini in large chunks. I had a feeling the zucchini would be over done and it was but the rest was cooked beautifully. The rice was well done like risotto. This is a great recipe for a night you want a full meal but need it quick. Short prep time and it was all in the pot. I tried this tonight and discovered my instapot doesn’t have a poultry setting. I didn’t have cornstarch either, so I used flour. Other than that followed the directions and it turned out very good. Thank you.